This is not the traditional Ethiopian dish by any stretch of the imagination. I’m using the berbere spice which is spicy and aromatic and gives the meat such depth of flavour. But using more of an osso bucco method for cooking it. The couscous is a great side for this dish with the sweet scent of orange and freshness of the coriander. salt & pepper to tasteHeat the oil in a large braiser or pot set over medium-high heat.Dry the lamb very well and sprinkle with 1 1/4 teaspoons of the salt. Dredge each piece in the flour and then shake off the excess. Add the lamb to the pan and sear on all sides until deep golden brown, 8 to 10 minutes. Remove the lamb to a plate.Add the garlic, celery, carrots and onions to the pan and season with the remaining 1/2 teaspoon salt. Cook until the vegetables begin to brown and soften, about 3 minutes. Add the tomato paste and berbere spice and cook, stirring often, to caramelize the paste, about 2 minutes.De-glaze with the wine and bring to a boil, then reduce the heat to medium and simmer for 3 minutes. Stir in the broth, the bay leaf and cinnamon stick. Nestle the lamb back in the pan and cover with the lid. Reduce the heat to low and cook until the lamb is soft and tender, about 2 hours.10 minutes before it’s ready, add the swiss chard and stir until wilted into the sauce. For the couscous, peel the zest from the orange, then juice the orange into a 1 cup measure. Fill the rest of the cup with the chicken stock. Put the chicken stock/orange juice mix into a pot with the peel and bring to a boil. Turn off heat. Add the couscous and cover for 10 minutes. Once ready, remove orange peel and fluff with a fork. Add chopped coriander and fluff again. 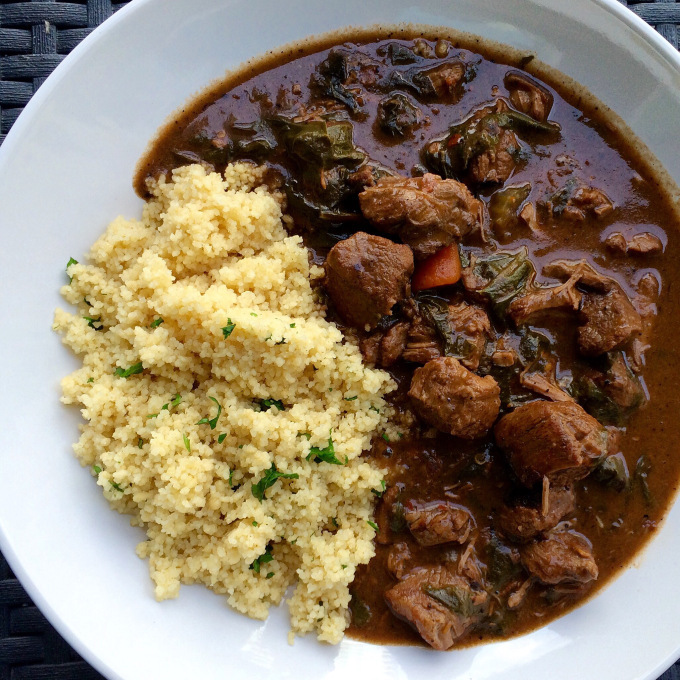 I used a red wine from Africa that had similar notes to the stew and paired well with it for serving. The couscous is a serving for two. But the stew could easily serve eight. I had left overs which I portioned out and froze. The stew also goes well with an unleavened bread.